I really like drones, but I hate the price of them. I searched for an affordable drone but was disappointed with the options that were presented to me. When I found this drone that was refurbished, I was a bit skeptical, but it has been an absolutely amazing drone for me. When I need to keep up with my friends’ drones, this does the job perfectly. It is fast, flies smoothly, and works really well. This is the perfect drone for a person who wants to play a lot. It has some cannon shooters and a grabber so you can pick up small items. It has a camera, so you can shoot but it can’t do video. The whole drone is made out of plastic, but you would never guess with how well it flies. There’s a 200 feet range, so you can fly high and far without losing your drone. When you purchase this drone you get the drone, and the cannon balls that come with it. 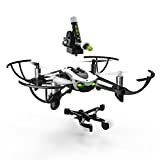 This drone is perfect for those who want to play a lot. Shooting the cannons is really fun, and the grabbing tool is cool to mess around with too. I really like the design of this drone. It is perfect for older kids. It goes pretty fast, and the range is good. The flight time is around 10 minutes and the charging time isn’t too bad. I wish the camera would film video, but such is the way of life. I think for $59, this drone is a steal. It is still a really great drone, and it has some fun features added like the cannon ball and grabber. I would buy it again, especially for a child who wants to get into drone flying.